In the past I purchased Mugen Power batteries for replacement or extended battery options for my devices. 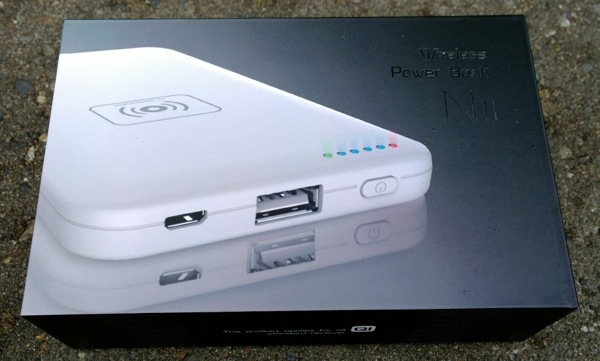 They recently sent along their Mugenizer N11 Qi Wireless Power Bank. I have used other portable battery solutions in the past, but they all required a cable connection to charge up your phone. The Mugenizer N11 lets you place your Qi-compatible smartphone down on the top to recharge your phone. Wireless charging is still not widely available in phones, but Nokia has made it a priority on their Lumia devices and uses the Qi standard. The Nexus 5 also supports Qi wireless charging. You can find cases and back replacements for devices like the iPhone and Samsung Galaxy that add Qi functionality. The Mugenizer N11 Qi Wireless Power Bank has a 4,800 mAh internal battery that you charge up via a microUSB port. They include a USB to microUSB cable and a USB A/C adapter to charge up the battery pack. If you don’t have a phone with Qi support then you can also use the full size USB port on the N11 with a cable to charge up your phone. Adjacent to the USB port is a small button that you press to initiate charging of your device. You will see six colored LEDs on the top near the button. They glow from pink to blue to green to indicate available charging capability of the battery pack. The green flashing light on the end of the string of LEDs indicates that wireless charging is active. The four center lights indicate available power level from 25 percent to 100 percent in 25 percent increments. The far left light is a power indicator light. You will notice the Qi logo at the center top of the Mugenizer N11 with a circle of raised rubber around the logo. This is the active spot for wireless charging so you need to make sure that your device is centered on the battery pack. I tested out the Nokia Lumia 1020 and Icon on the N11 and they both connected just fine. The Mugenizer N11 is available now for $69.95 and comes in white with a glossy finish. It is quite light ate 230 grams. The output of the battery pack is 5 volts at 1 amp. The battery pack is a bit large for 4,800 mAh, but you need something with decent size to make sure you can safely place your device on it and not worry about it falling off. I found the charger to be quite convenient and like the capability for wireless charging on the go. I have Qi plates on my desk and would love to go to an all-wireless charging strategy for my devices. @Robert It’s good for nexus 5 but if you are looking for a Qi Wireless Charger for your iphone 5 it is available in Amazon store.